There seem to be a few tutorials doing the rounds of late … so you’re going to get another one – on planning. So if you’re somebody who wondered how it is done, or are somebody who casts a rudimentary eye over the ground, skims through the orders and then just launches across the line of departure with the view to developing a plan on the hoof and wants to change this – then this is the thread for you. What do you get from this thread – simply put it will delve into the planning process and then roll into an AAR. I am playing this as designed so Axis attacker versus the AI. So without further ado, let’s crack on with it. Also I’d be grateful if people could refrain from posting spoilers on this mission if you’ve played it – I haven’t yet – which is kind of the point of stepping through the planning process first!!!! I will warn you that I am no means an expert on military planning but have been around it enough to know how it works. I will cut corners with it here and there but this isn’t necessarily about military doctrine, it is about giving you guys an understanding of some techniques to help you plan your battles should you have a mind to do so. Clearly questions (that do not contain spoilers) are welcome but many of my answers might be ‘I’ll come to that later’. Very cool. Looking forward to this one. I just downloaded the scenario. If RL and my PBEM games allow me the time I may try to follow along with my own game. This sounds like something I will learn from. Thanks for doing it. I love seeing you filling that need Combatintman... really curious to where you take this. Always interesting to see how others approach things to see how similarly or differently they go about it compared to myself. The deepest planning I have done on occasion with very large forces is to make a tactical map with a screen shot, then take it into a military sketch program called "Overlay Maker". The program has ready made NATO/OPFOR icons you can place, move around, and update turn by turn. Seeing the force in this different overview has helped with being more organized in planning for large forces, but it takes time so I I have only done it a few times. Another cool feature is you can zoom into the map. I look forward to seeing your method Combatinman. These threads are especially helpful to new players who don't really know how to go about it well. I'm sure there will be some good tips here. Seeing the force in this different overview has helped with being more organized in planning for large forces, but it takes time so I I have only done it a few times. Another cool feature is you can zoom into the map. You're not wrong there - I started putting this together in April I think!!!! For the planning process, I am going to use a number of planning models or tools that I’ve come across in my career – many of you board regulars will have seen some of these in other similar threads but some may be new to you. I’m not saying that these are the best tools or that this is the only way to skin the cat – it is just the way I have chosen to do it. The framework MDMP (Military Decision Making Process) I am going to use is the UK Combat Estimate, which is also known as the 7 Questions. The main reason I am using this format is because I am very familiar with it (I was involved in the trials) and I find it very intuitive. The basic premise is that if you answer all of the 7 Questions you will have a plan at the end of it. Q1 What is the enemy doing and why? Q2 What have I been told to do and why? Q3 What effects do I want to have on the enemy; and what direction must I give to develop a plan? Q4 Where can I best accomplish each action or effect? Q5 What resources do I need to accomplish each action or effect? Q6 When and where do the actions take place in relation to each other? Q7 What control measures do I have to impose? The blue lines are a 100m grid overlay. Our forces are counterattacking. Having detrained merely days ago, your Regiment has been pushing around the flank of the Soviets, looking for an opportunity to halt the Russian juggernaught. Your panzergrenadier company has been tasked with securing the flank of our regiment's counterattack by taking a town overlooking an important road highway. Located on the reverse slope of a ridgeline, you determine that a wooded grove just NW of the town (and SE of your assembly area) would be the perfect place to form up your company before it's final attack on the main Soviet defenses. The morning of your attack, you begin to move your company to take your assault position. Secure the woods to your south west. Your 1st PLT is currently staged on the road leading into the village of Osinnik. 2nd PLT is not far behind and will arrive within the next 5 minutes. Your 2 company mortars are in trucks and will arrive within 10 minutes. Currently our friendly tanks are occupied in more important areas on the line, and the only support battalion has attached is in the form of a Sd.Kfz. 251/17, travelling with your 2nd PLT. The enemy defense is not expected to be fairly strong. Their tanks are many kilometers to the west, and are using their regular rifle infantry to hold the corridor. The forces to your immediate front are an outpost line, delaying our advance to give their main defense on the reverse slope more time to dig in. There should be no more then a platoon of dismounted infantry, though expect several machine guns and anti-tank teams. Friendly observers had been using Osinnik to direct fire, but were driven out by a small Russian patrol last night. Expect no more then a scout team in Osinnik itself, with the majority of their forces in small blocking positions south of the village among the treelines. Utilize your HMGs, halftracks and mortars to suppress the enemy and secure a foothold in the woods to your SE. 500 points for each objective, 500 for inflicting casualties, for a total of 1000 points. Russian side scores the same, weighted heavily towards vehicle kills. Preserve your halftracks, they are easily destroyed! I have attached these orders as a PDF for you to refer back to as we go through this process. So that is the problem laid out – time to get on with solving it so here we go …. The main reason I am using this format is because I am very familiar with it (I was involved in the trials) and I find it very intuitive. Located on the reverse slope of a ridgeline, you determine that a wooded grove just NW of the town (and SE of your assembly area) would be the perfect place to form up your company before it's final attack on the main Soviet defenses. Very interesting that you were involved in the trials. That has to look impressive in a military personnel file. I really like that 100m grid overlay. I wish there was an in game way to toggle those on and off along with contour lines. One of the things about CM that occasionally confuses me is the compass and the way the maps are oriented (or not). My brain always wants to think of the top of the map as north but in CM the top can be any direction. So my question, is the wooded grove NW of the town or is it also SE? Or maybe I am having trouble sorting out directions since the top of the map is not north? MOS - Yes, they were interesting times - I worked in a command and staff trainer as an observer controller .... this meant I got to paid to watch other people struggle with it and then tell them how good/bad they were at it. When work is involved I prefer watching to doing. Top right of the map is SE as per the compass annotation I've added on the graphic. Don't worry about confusion - I think I got about half way through describing the ground working on the assumption that the bottom of the map was South and the top of the map was North only to have that aarrggghhh!!! moment. Once I got over that moment I cracked the editor open and confirmed the directions and then put the compass rose on all of my relevant graphics. WRT your confusion - the town mentioned in the orders document is not on the CM map - I think this is what is throwing your brain out of kilter. If you ignore the town part of the description for the time being you should be all good. The way I read this is that the Germans are advancing from the setup zone (in the NW) to a town off-map to the SE. The final form up point identified in the wooded grove is in between the setup zone and the off-map town. I agree with having a 100m overlay that can be toggled, I think it would be a useful player aid for judging distance/ranges quickly and easily without having to resort to using the targeting tool. 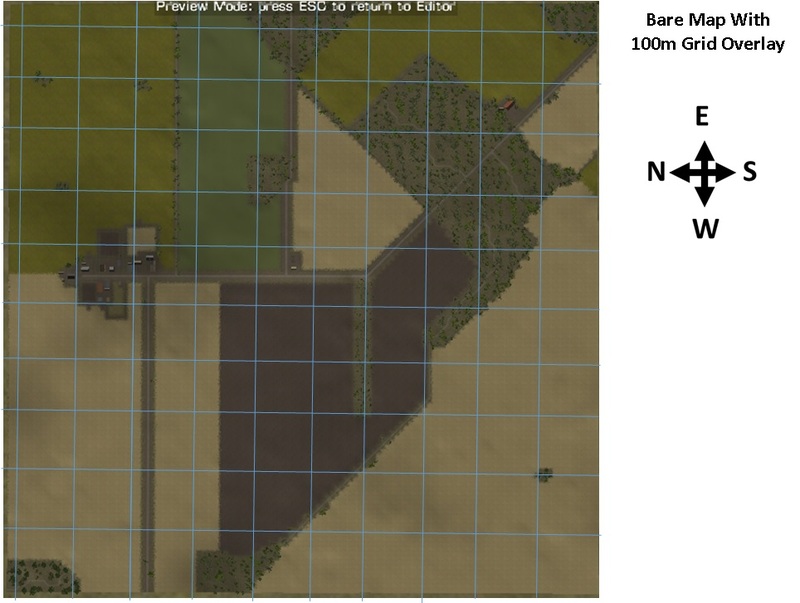 To generate the 100m overlay I cracked the map open in the editor and physically drew grids on it at the 100m points. Once done I screen grabbed with FRAPS and then just overlayed the grid in Powerpoint. Ah! Thank you for clarifying that! Makes more sense to me too. QUESTION 1 – WHAT IS THE ENEMY DOING AND WHY? 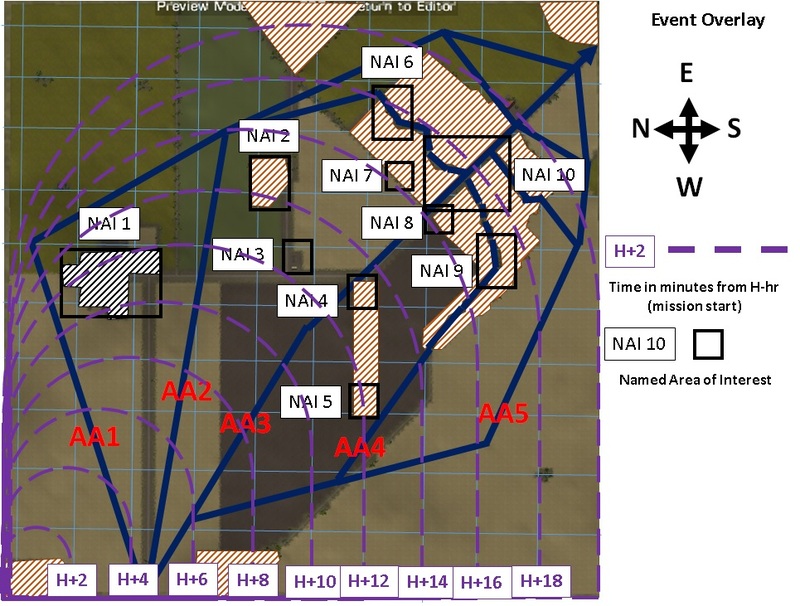 Battlefield Area Evaluation (BAE) which in simple terms is the ground and weather. Threat Evaluation (TE) where you look at the enemy in isolation according to organisation and doctrine. To do this properly I’ve had to crack open the scenario editor to get some of the mission data, however rest assured I have not had a sneaky peek at the Russian forces or setup. So from a combination of information supplied to me from the map, orders and the data screen in the editor here is what I have come up with. According to the data screen it is 250700Jun44, the ground is damp, temperature is cool with overcast skies. Wind source is from the West with heavy wind. Wind direction will blow smoke from my setup zone up the map as I look at it, this could be an advantage when using smoke to masking any approach into the woods from the West but is negated by the wind speed. Overall judgement is that I should not rely on smoke and weapon accuracy over long range could be effected. Ground conditions, when combined with terrain mean that all vehicles should manoeuvre carefully when off road. Temperatures should have no adverse effect on dismounted troops. Despite the overcast skies, visibility will be generally good. The area of operations (AO) is approximately 1km x 1km and is best described as a mix of open and close terrain. 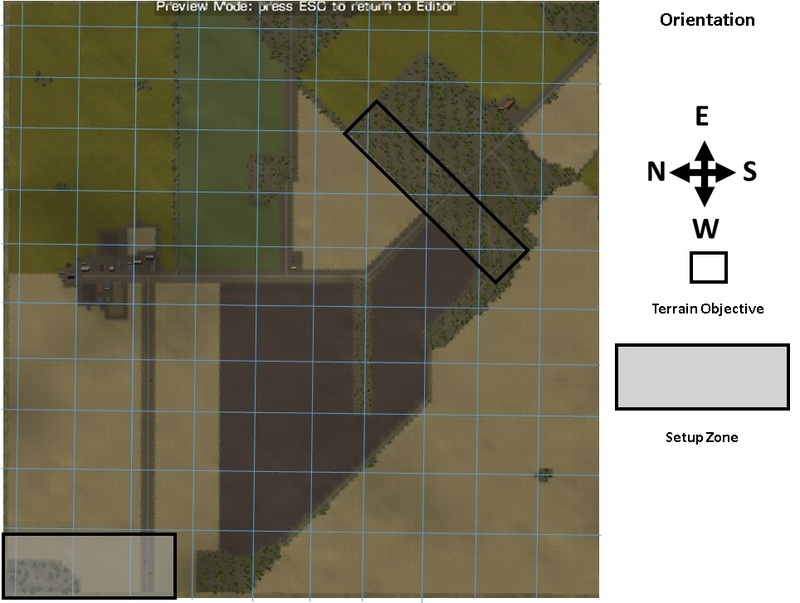 The two principal features are the small village (Village A) and the large wooded feature to the South which is the form up objective specified in the mission orders. The remainder of the ground comprises open farmland and small wooded areas with a single road running generally West to SE. Elevation is best described as rolling countryside with low ground to the South rising to higher ground to the East. The only readily identifiable features that provide true cover are the buildings, the majority of which are located in Village A. There are two additional small building complexes, complex D which lies between Village A and the wooded objective and a small complex at the NE exit of the woods near annotation L. Otherwise, all wooded areas provide good concealment with the best concealed positions located in the depths of the woods. There are no significant natural obstacles with the exception of some small areas of heavy woods. Overall the natural environment would be rated as unrestricted with areas of restricted terrain around village A and all wooded areas. Although not a significant obstacle, I am aware that the boundary of the woods is delineated by a single strand low wire fence and this may expose my dismounts as they enter the woods. My intelligence briefing states that the enemy has a probable scout team deployed there. It is therefore important because the enemy has deemed it important and because it overlooks my initial deployment area. It is also important because it covers AA1 and AA2 and can disrupt manoeuvre along AA3. If I choose do so, once I get into Village A, it allows me overwatch and a base of fire into Wood C, Complex D and parts of Wood E.
Although not apparent from the top down view, close analysis shows that Wood C is on high ground and forces on this position cover AAs 1, 2 and 3. In addition they have overwatch on to my start position. Most importantly, this position gives good observation and fields of fire across the northern boundary of the main woods, Complex D and the Eastern extent of Wood E.
Comprises two buildings which offer both cover and concealment. It covers AAs 2 and 3 and to a limited extend, parts of AA1. Most importantly it again provides a potential good base of fire across the North of the main woods as well as Wood E.
Are as marked on the schematic – in essence there are five broad avenues of approach with a number of branches designated AAs 1-5. Command and control is extremely difficult due to close terrain and limited visibility. Observation and fields of fire are limited. Indirect fire is extremely difficult to employ effectively due to limited visibility and command and control issues. We will look at Threat Evaluation next. Outstanding. Love your map overlays.. nice to see a pro in action. Interesting that all of your Avenues of Approach avoid the restricted terrain until the large wood mass in the upper right corner which you obviously plan to enter. I just find it interesting that you are not using them as interim objectives... if you run into enemy activity in one or more of them you will have to clear them anyway to enable your main combat power to bypass (if that is indeed your plan). Looking forward to the threat assessment. I think the post to the scenario you are playing, Assault Position, is below. A link to the download is in the post. (I could not link the scenario download directly) BTW SeinfeldRules has several interesting scenarios in that thread. Bill - we are way off the plan at this stage - you won't see a scheme of manoeuvre for a few days yet. This is what I believe is one of the strengths of the Combat Estimate - rather than rush into a scheme of manoeuvre, the process encourages you to resource the plan - once you know the resources and where they are needed, you come up with a scheme of manoeuvre to get them there. MOS - thanks for the pickup on my link to the scenario - post #1 has been updated - cheers mate. Bill - I'm probably preaching to the converted but the IPB process requires drawing Mobility Corridors (MCs) and then deriving Avenues of Approach from those MCs - they should be drawn over areas where manoeuvre is unrestricted. Now I haven't slavishly followed the doctrine in deriving my AAs (had I done so AAs 1,2 and 5 would have been the only ones on the schematic) and I have skimped a lot on my labelling of AAs (more likely MCs to be honest) for simplicity, but the ones I've come up with reflect AAs I can use (albeit with some constraints) with the force mix I have. Recall that in this step we look at the enemy in isolation focusing on organisation and tactics. Comprised of an outpost line from a UI Rifle Regiment of approximately platoon strength located IVO the wooded grove and 1 x probable scout team IVO the village. Probably reinforced with ATR and MG teams. No armour expected. As context to these deductions I will discuss MGs, observers and mortars mainly because these were the things I had to think about. I went for 3 x LMG teams as an assessment based on the statement that the enemy would be reinforced by MG teams. In TO&E terms, the natural choice would be HMG teams because they sit within the TO&E but in relation to the assessed enemy outpost mission, the imperative is to be able to extract back to the main defensive position and HMGs are less able to do that than LMGs. Observers are not specifically mentioned but again by thinking about the outpost mission context, it is logical to assume that the outpost will be covered by some form of indirect fire assets and observers provide the best means of calling this support in. I went for mortars in my assessed enemy grouping because these do sit within the TO&E and can be better employed in woods and forests than other forms of artillery. The enemy cannot defend everywhere and must have a compact defence to maximise combat power and facilitate command and control. The enemy has limited long range firepower and therefore is likely to prefer short range engagements. The enemy’s anti-tank rifles and MGs are his only effective ranged weapons. The enemy is limited to what he can carry and therefore lacks the ammunition to sustain lengthy engagements. 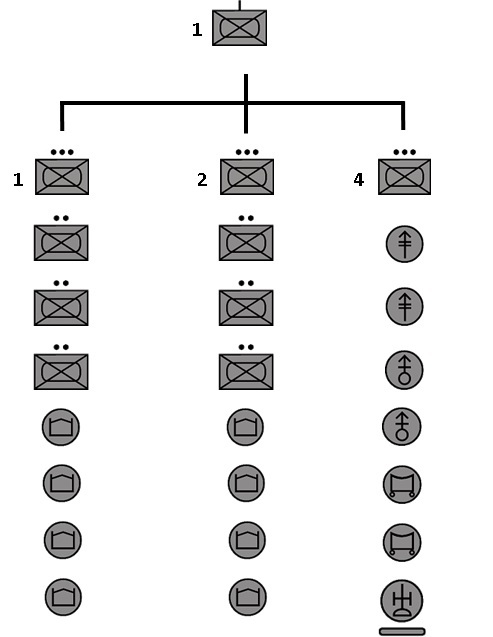 A rifle platoon on outpost duty will act as a large picquet from an outpost battalion (or outpost company) or as a self-contained permanent large picquet directly from the regiment (or battalion). Not to allow enemy scouts to approach the rest of the forces. To secure the resting troops (main body) against machine-gun or mortar bombardment, against attacks by enemy tanks, armoured vehicles and motorised infantry. The large picquet post covers a front of 1-1.5 km at a distance of up to 4km from the resting troops. In principle, the large picquet post is reinforced with HMG, mortars, cannons and anti-tank rifles, sappers and chemical defence troops and must be supported by artillery fire from the main positions. Added to this and returning to doctrine we need to generate a doctrinal template. 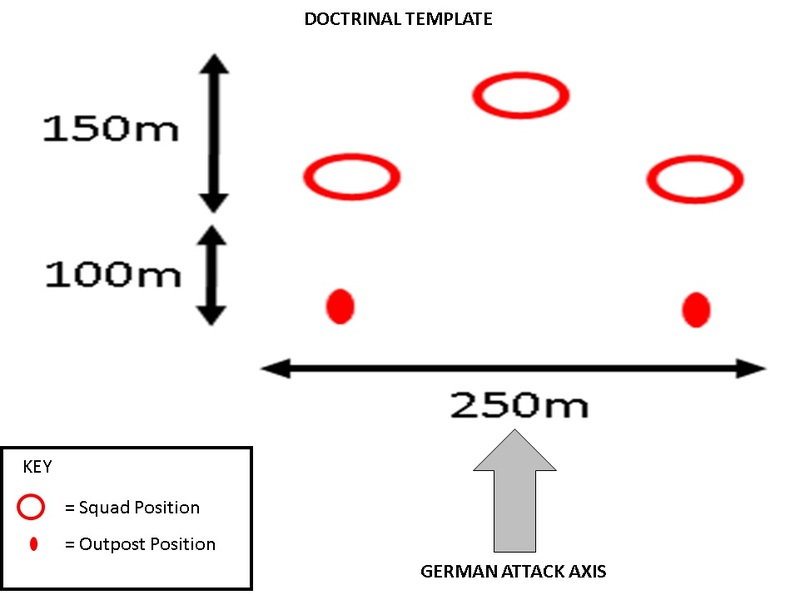 This is a graphic which shows how the enemy would deploy/manoeuvre according to his doctrine. Doctrinally the platoon would have outposts about 100m forward of the main position over a frontage of about 250m. The main position would be about 150m in depth over the same 250m frontage. Doctrinally I should identify HVT at this stage … HVT are those that are important to the enemy commander’s mission. Personally I am not a fan of doing it at this stage, because if you identify them here you are just making work for yourself … we will return to this later. So that is Threat Evaluation squared away ... next step is Threat Integration which predictably will be covered in the next post. Yeah, sorry I meant intent when I said plan i do understand you are nowhere close to that yet. Makes sense for a mounted unit to avoid restricted terrain, but that doctrine can't hold true in all or even most cases, especially if the unit is not mounted, and yes i understand that these AAs will encompass the restricted terrain as well, but i would orient on them personally as they will need to be cleared, but then, I'm not a pro. BTW, love your threat evaluation.. of course you aren't fighting a doctrine based foe, but a force setup by a designer that may or may not be aware of proper Russian army doctrine in this situation.. of course this is just a template and is intended to give you an idea on what you "could" be up against so it of course is a very useful exercise. Great reading and am enjoying this immensely. Recall that in this step we combine our analysis from Step 1 (BAE) and Step 2 (TE) to come up with a likely enemy course of action. Also don't forget we are still in Question 1. X Platoon Group is to deny the woods IVO OSINNIK Village until 250800Jun44 in order to allow the regimental main body to prepare its main line of defence. Delay German attacks through direct and indirect fires. This is all very well but it is now time to return to the ground to work out what is feasible given the resources available to the enemy and his preferred tactics. So some context about the ground and effects specific to the defender because my previous analysis, particularly that relating to Key Terrain, was focused on my mission. Mainly for the same reasons I designated it a key terrain for myself – but most importantly because the enemy is reported to be there. Designated because these are the most likely points of entry onto the wooded objective for any attacking force. This crossroads blocks avenues of approach from entrances F, G and H.
It is also worthy of note that Woods C and E and Complex D would be suitable outpost locations but are not significant enough to warrant the deployment of significant combat power given the Red Army commander’s limited resources. As you can see from the graphic, some manipulation is now required to turn this into a viable defensive COA on this particular piece of ground. Also on my initial laydown, I have not taken into account the probable scout team reported to be in Village A. So let’s do that now. The graphic above becomes COA 1 which I will call ‘Defend Forward’. In this COA we have the reported probable scout team in Village A which provides coverage of AAs 1 and 2 and then all three assessed rifle squads have pushed forward scout teams IVO Complex D, Wood E and Entrance H. The main outpost line is linear and lies back from the forward edge of the main wood. In this laydown the eastern most squad can cover Entrance F and any advance along AAs 1 and 2. The centre squad can cover Crossroads I and AA3. The westernmost squad can cover Entrance H and approaches up AAs 4 and 5. Note that there is nothing in Wood C but it is possible that the scout team in Complex D could equally be positioned there or Wood C could be a fall-back position for the scout team in Village A once it decides that remaining in Village A becomes untenable. This is marked in the diagram by a dashed circle. Also note that the westernmost scout team could also be located further forward at the western end of Wood E and achieve the same effect of covering Entrance H and AAs 4 and 5. This is marked in the diagram by a dashed circle. 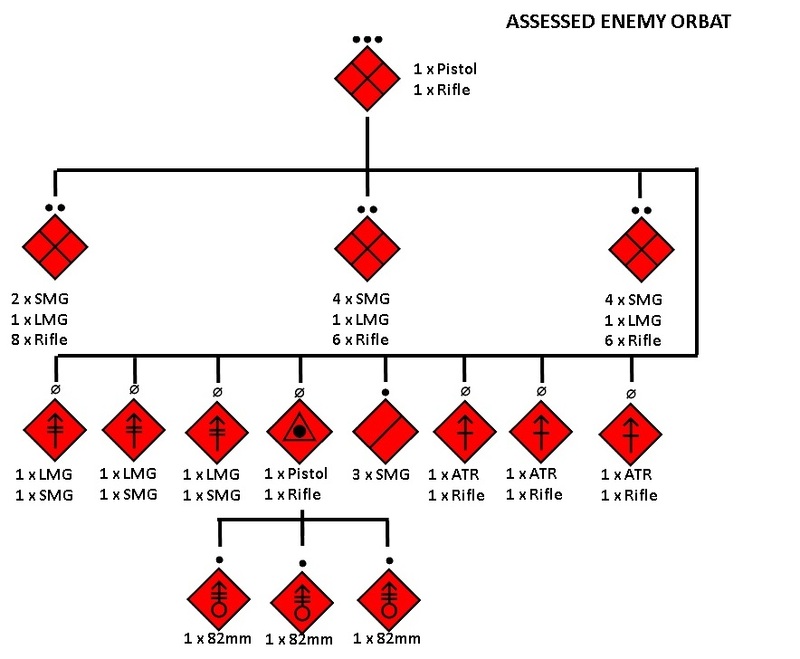 Each of the platoon scout teams in this COA I would see as being augmented by an LMG squad and an ATR squad to take advantage of their ranged capabilities. The role of these teams being to identify my avenue of approach and to disrupt my attack by engaging HVTs before falling back on to the main outpost line in the woods. The probable scout team in Village A will likely have an observer grouped with it and its role will be to identify my avenue of approach and disrupt my attack through indirect fires before falling back to an alternate position in either Wood C or Complex D.
Allows early identification of the German axis. Allows early attrition of the German attacker. Makes best use of ranged weapons. Makes good use of concealment in the main wood. Linear outpost line does not provide mutual support. Defence can be outflanked and taken down from the rear. The graphic above becomes COA 2 which I will call ‘Defend Deep’. In this COA we have the reported probable scout team in Village A which provides coverage of AAs 1 and 2 and then all three assessed rifle squads have pushed forward scout teams IVO the northern perimeter of the main wood. The main outpost position is constructed as a standard defensive position with two squads forward and one back with the killing area centred on Track Crossroads I. 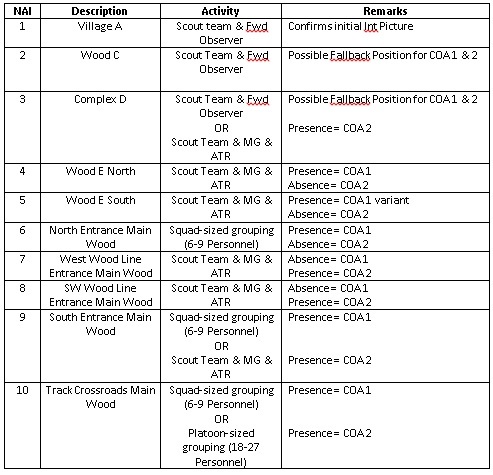 This laydown means that the probable scout team in Village A covers AAs 1 and 2. The easternmost platoon scout team provides very limited coverage of AAs 1 and 2 and good coverage of AA3. The centre platoon scout team provides coverage of AA3. 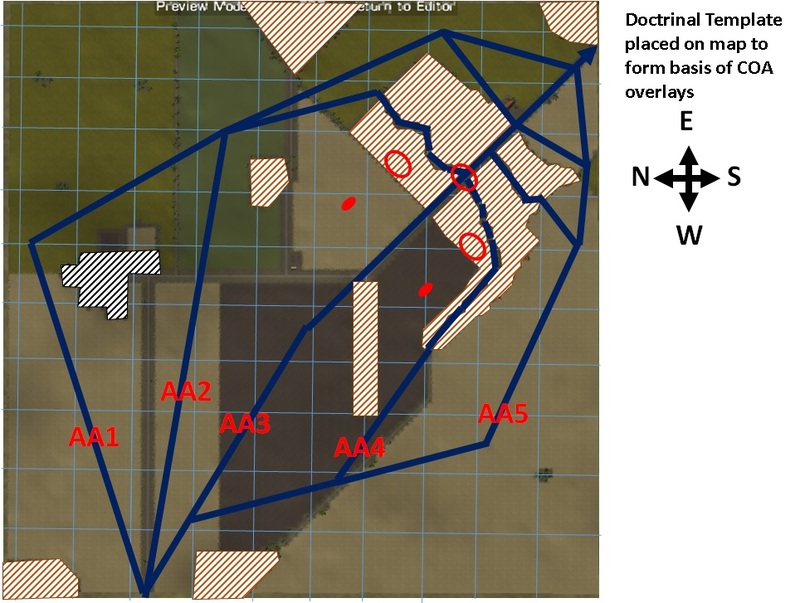 The westernmost platoon scout team provides good coverage of AA4 within the main wood and limited coverage of AA5. 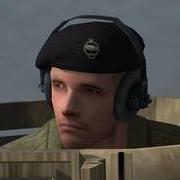 As with the previous COA, I would see each of the platoon scout teams having an LMG and ATR team grouped to permit best use of those weapons systems and the scout team in Village A having an observer grouped with it. Excellent use of concealment in the main wood. Good all round defence and mutual support. Provides best defence of Track Crossroads I. Limited observation and fields of fire over avenues of approach. Limited ability to maximise use of ranged weapons. Surrenders initiative to the attacker. Allows easy break in to the main woods by the attacker via entrances F, H, K and L.
Scout team in village A is entirely dislocated from the main force. I can cover the AO in 20 minutes. The earliest I can assault Village A is H+10 or 0710 hrs in the scenario. Related to that, enemy in Village A may attempt to extract at the same time. The earliest I can assault Wood E is H+12 or 0712 hrs in the scenario. Related to that, enemy in Wood E may attempt to extract at the same time. The earliest time I can start my clearance of the Main Wood is H+16 or 0716 hrs in the scenario. The earliest time I can finish clearing the Main Wood is H+20 or 0720 hrs in the scenario. These are all useful for planning and particularly any synchronising and phasing required. It also gives me a window (H+10 to H+12) to potentially acquire track and engage moving enemy targets. So that was a very basic look at the timings, now I will focus on the Named Areas of Interest (NAI) part of this product. The NAIs show where you need to look in order to acquire the enemy and determine his likely COA. This product will later be refined but for the time being let’s look at NAIs. NAIs are placed based on the previously derived enemy COAs. In simple terms, wherever an enemy is reported or wherever you assess an enemy grouping to be is the starting point. The process involves drawing a box around those areas and if required, refining those boxes or combining them. This is important to get right because ultimately each of those NAIs should be covered by a reconnaissance asset, and ideally for redundancy two assets. Clearly the more NAIs there are to cover, the more troops you have to allocate to the task. To complete the process and to add meaning to the above, an Event Matrix is produced and the combination of these two products drive the Collection Plan and ultimately the plan as a whole. In the Event Matrix you are basically defining, where you are looking, when you are looking, what you are looking for and what it all means. I will ignore the ‘when’ part of this for simplicity and because I don’t think it is a war-stopper given that the only moves I anticipate from the enemy will occur in the H+10 – H+12 window. Platoon HQ – Destruction of this will affect enemy C2 and morale and reduce his ability to communicate back to higher HQ. Forward Observer IVO Village A – Destruction of this limits the enemy’s ability to call in indirect fire. Anti-Tank Rifle Squads – These are the only assets that can effectively defeat my light armoured vehicles. I could go further with this but the more I add, the more I have to target which means allocating assets. The above list is the minimum needed to effectively limit the enemy’s ability to achieve his mission. The above, although it is truncated, is about as far as we need to go with Question 1 so next time we will move on to Question 2 – What have I been told to do and why? This in effect is Mission Analysis and there are many ways of cracking this nut and again I will pare this down to what I consider to be essentials for this situation. Fantastic post. i couldn't even imagine that so much planning is done before execution. Thanks for the comments - there is an argument that too much planning is done these days which creates undue complexity. I think there is a certainly merit in that argument. In the context of this scenario and the amount of planning a German company commander would have done in 1944 the effort expended would be far less than that I am showing here. That is mainly because he didn't have a massive staff to do the planning and he would probably be fairly experienced so would be able to plan intuitively. As stated, the purpose is not to show you German company level command and control procedures, it is to show you a planning methodology for your education and to assist you in planning your missions and maybe apply them to scenario design too. What I certainly wouldn't advocate is planning to this extent every time you fire up the game ... believe me you'd hardly ever play and that is no fun at all!!! Anyway - thanks again for following the thread and hope it is useful and interesting. Yeah, that is great stuff. If nothing else it will give the layman an appreciation for what a staff takes care of during an operation. Wow, this is great, seeing one of my scenarios used in such a fashion - makes all the work worth it! Hopefully the scenario execution won't let you down. For everyone reading, this stuff really does happen, in this level of detail too, especially at the battalion level. And as an artilleryman and fire supporter, I get to see this level of planning from the maneuver guys every time I go to the field - and every time I'm thankful my job is the easy part of all this - blowing stuff up! QUESTION 2 – WHAT HAVE I BEEN TOLD TO DO AND WHY? Mission Analysis Step 1 – Review the situation. Here you look at aspects such as time, how the IPB affects the battlespace and own forces. The time is a given – I have one hour. In reality, planning and rehearsal time would be considered and the amount of time required to get to the Area of Operations (AO) plus the time required to complete the mission. These are not factors in CM because the forces are in place and there is only one person planning and controlling all of the forces so we just need to be aware of the fact that we have an hour to do this. From my IPB event overlay I can see that it will take me about 20 minutes to move from my start point to the far end of the Main Wood objective. Although I could do more with the IPB aspects for friendly forces, you have seen enough to see how it works so there’s not a huge amount of value in revisiting them. First up there is an error in the briefing which states that 1 Platoon is on the map, 2 Platoon will arrive in 5 minutes and the mortars will arrive in 10 minutes (I think I'll allow SeinfeldRules the error because his missions are awesome ). In reality 2 Platoon is on the map, 1 Platoon arrives in 5 minutes and the mortars in 10 minutes. For the purposes of Mission Analysis, this makes no real difference. So in essence I have one command element, two manoeuvre elements and a support element which is capable of protected mounted and dismounted manoeuvre and can bring direct and indirect fires on to the enemy. Force flow is such that I cannot bring all of my combat power to bear until 0710 hrs at the earliest and realistically (taking into account the time required to set up mortars and cue indirect fire) until 0720-0725 hrs. On top of that (ignoring the trucks) I have 8 x Sdkfz 251/1 half-tracks each armed with an LMG and I have 1 x Sdkfz 251/17 mounting a 20mm cannon and my two mortar teams each have 1 x 81mm mortar. 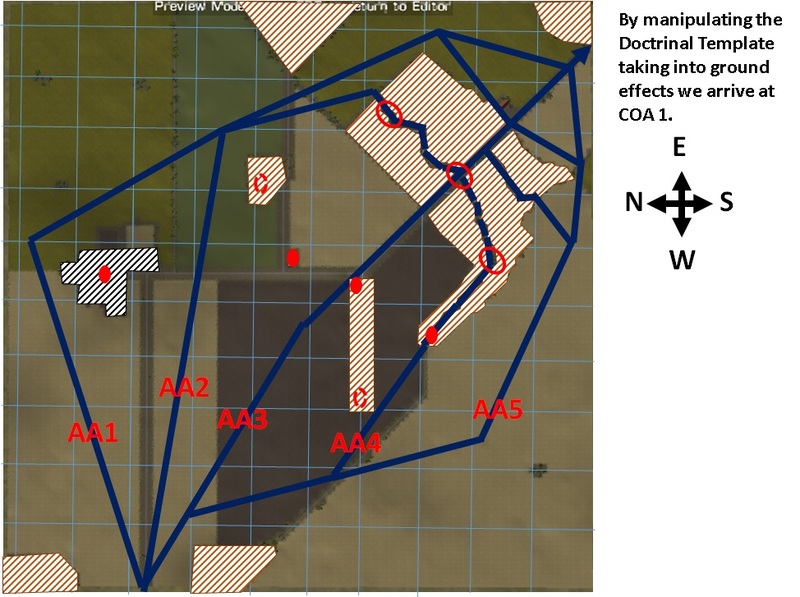 The reason for analysing own forces in detail is to establish things like force ratios and relative combat power as well as identifying those soft factors which could influence allocating units to task later on (eg I may prefer to allocate the more difficult tasks to those units with the most experience, best leadership and best morale while allocating easier tasks to those units that score lower in those factors). My best led units are Coy HQ, 1 Squad/1 Platoon, 2 Squad/1 Platoon, 1 Squad/2 Platoon, 3 Squad/2 Platoon and 4 Platoon HQ. 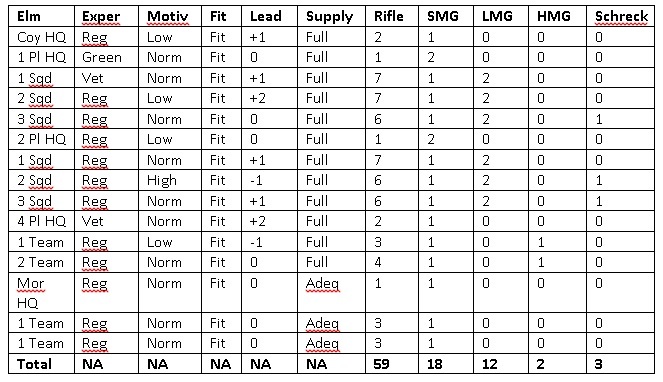 I have 14 x LMG/HMG among my dismounted elements. I have only 2 x mortars. I will return to friendly forces later, but for now this is a good enough start because hopefully already you have seen that the hour that I’ve been given for this mission is suddenly looking less generous than it did at face value at the start. Mission Analysis Step 2 – Analyse superior commander’s intent and own mission. This is the core of the Mission Command or Manoeuvrist Approach style and in reality commanders and staffs will really pick this apart. In CM games, there is less value in doing so because what happens two up and one up, which in this mission’s context would be Regiment and Battalion has no effect on the mission. This means that we can skimp this step a bit. So what to pick out of all of that, I know about my 2 up level of command (Regiment) but not too much about my 1 up level of command (Battalion). I also at this point bump up against another artificial situation. This is because it states that my overarching mission is to take a small town to protect the regiment’s flank. What this means is that in reality, this scenario is one small part of a plan to take the town and would therefore not have its own dedicated set of orders and detailed plans. However, we can move on from this, it is not a showstopper but I point it out for context. For the purposes of Mission Analysis though I deduce straight away that I have to take a small town later so I am going to need to conserve combat power. I also deduce that as my task is all about flank security, I am unlikely to be on the Regiment’s main effort which means I’m not going to be high on the list for support priorities. to gain possession of a position or terrain feature, with or without force, and to make such disposition as will prevent, as far as possible, its destruction or loss by enemy action. 1 Kompanie is to secure Main Wood NLT 250800Jun44 in order to provide a line of departure for the attack on the town. Mission statements should state who is to do what, where at what time and then have a unifying purpose. The unifying purpose is the ‘in order to’ part of the statement. This is key to the manoeuvrist approach because it allows subordinates to understand the overall intent and put things into context. My in order to statement is not the best to be honest but it serves the purpose. So that is all pretty simple then … next time we will finish off Mission Analysis by completing steps 3, 4 and 5 of that part of the process.